The Jesus de la Limpia, also known as the "La Capitana" sank off the coast of Ecaudor on October 26, 1654, after striking a submerged reef. She was the largest ship built for the Spanish King Philip IV at 122 feet long with 60 cannons. The ship carried the bulk of the fleet's treasure, estimated at 5-10 million pesos of silver. The ship was so overloaded with treasure that efforts to free the ship in 22 feet of water proved futile. About two dozen aboard the ship drowned while trying to reach the shore. The Spanish were able to promptly recover the bulk of the treasure (only to loose it again two years later with the wreck of the Maravillas). The ship was rediscovered and salvaged in 1997, yielding about 10,000 Spanish cobs, mostly 4 and 8 reales. AUTHENTIC PIECE OF EIGHT TREASURE COIN 8 Reales Treasure Cob Coin from the La Capit.. 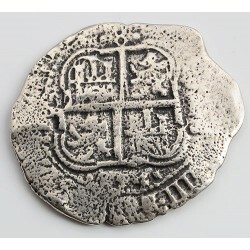 AUTHENTIC PIECE OF EIGHT TREASURE COIN 8 Reales Treasure Cob Coin from the La Capitan..
8 Reales Treasure Cob Coin from the La Capitana Shipwreck of 1654 A beaut.. AUTHENTIC PIECE OF EIGHT TREASURE COIN 8 Reales Treasure Cob Coin ..
8 Reales Treasure Cob Coin from the La Capitina Shipwreck of 1654 A beaut..
8 Reales Treasure Cob Coin from the La Capitina Shipwreck..